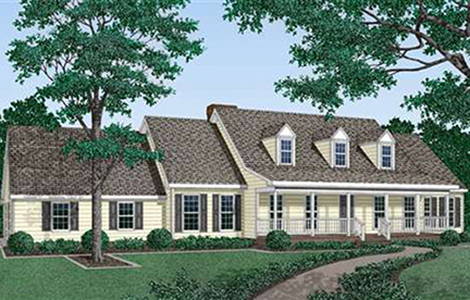 A traditional country home design with abundant amenities, the Daisy includes a farmhouse-style front porch that gracefully extends the living area outdoors. The friendly, welcoming style hints at the comfort to be found inside: Dining area allows natural light and views of the front yard through tall windows. Kitchen features a pass-through counter. Great Room offers abundant space and includes a fireplace flanked by French doors. Fair weather can be enjoyed out on the Daisy�s back deck. 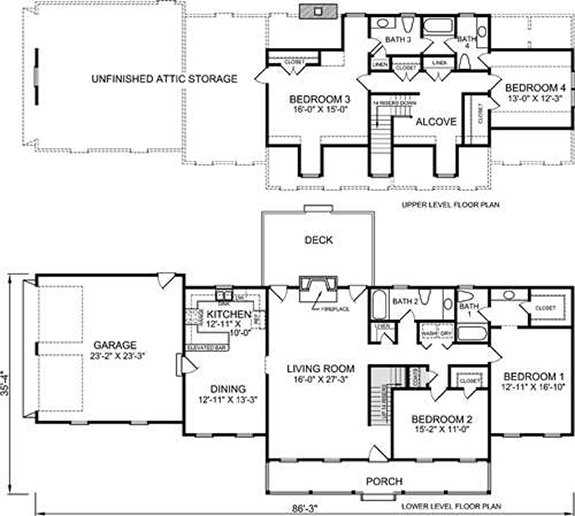 Master suite consists of a large bedroom, a private bath, a dressing area with a double vanity, and a walk-in closet. Second bedroom on the first floor can also function as a nursery or home office. Bedrooms 3 and 4 offer roomy closets and share a walk-through bathroom.